I don't go to cafes often. In over two and a half years of writing for this blog, I have never done a real cafe. The reason? Because there are virtually no "real cafes." And it is not so much that all the good ones have gone out of business - there were really very few good ones in the many years I have lived in New York City. The Figaro Cafe, for example, (recently closed) was never all that great - it certainly was not intimate, charming or romantic. I would imagine it was an interesting haunt when it opened over 50 years ago. Most places have been quickly over run by a stampede of tourists. So a person always had to know of places or hunt and forage. For me, ambiance is a necessary condition for a cafe and La Lanterna is one of the most atmospheric cafes I have been in. Two floors each with a fireplace, dark woods, low lighting and a beautiful year round garden. Reviews characterize it as frequented by students from neighboring NYU. 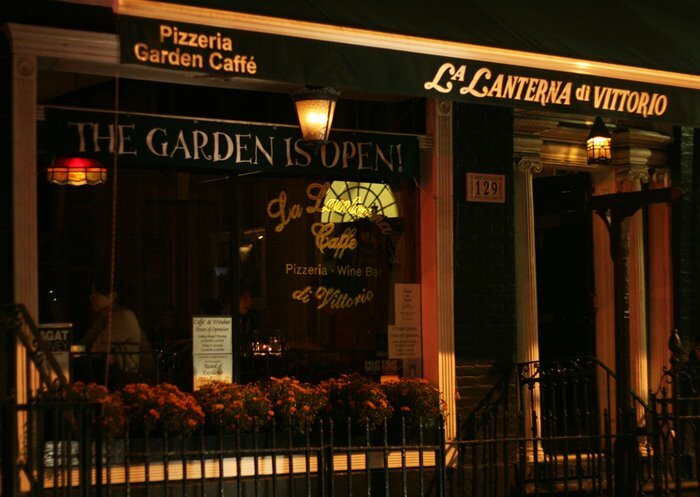 I can not attest to this, however Lanterna is not a real inexpensive place and the cafe is extremely well maintained - La Lanterna does not attract a boisterous crowd and any student traffic is well behaved. Contrast to a place like Think Coffee for example, which is essentially under assault by students. La Lanterna di Vittorio at 129 MacDougal Street was opened in 1976. It offers an excellent selection of pastries, gelato, the requisite coffees and a wine list. The menu also has a pretty extensive selection of food, enough for a light meal - pizzas, bruschetta, salads, soups, panini, crostini, calzone, carpacci, fish and cheese. See their website and menu here. My only disappointment is that I can not tell you it dates to the 1800s with a history like Les Deux Magots in Paris or that it is on a wonderful romantic sidestreet like Commerce Street (don't be put off by the name) or Grove Street. It is certainly not in a secret, off the beaten path location. Ironically, it is located on MacDougal street, a block north of MacDougal's primary commercial block between West 3rd and Bleecker Streets (if you venture on that block, be prepared for to enter one of the most conspicuously unattractive and touristy streets in the Village.) Perhaps this is one reason it is often overlooked.